From the Mongolian steppe to the South African desert, barrier islands to city streets, Langrish has recorded the lives and activities of these majestic and beloved animals. His images capture the grace and soul of horses in all shapes and sizes. Brisk, lively text by Olympic gold medalist Jane Holderness-Roddam accompanies each photo, relating the story of how horse behaviors and traits vary by habitat, as well as the behind-the-scene details of Langrish’s adventures. 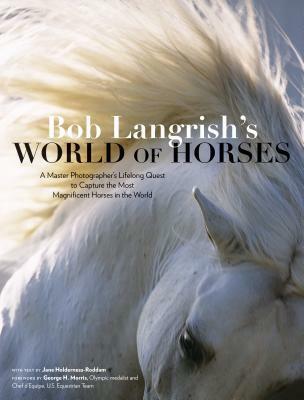 Dramatic, poignant, and personal, Langrish’s photos are a testament to the ancient and abiding horse-human relationship. If you are a horse lover, there is much to admire about the collection of images in Bob Langrish's World of Horses. I have only ridden a horse once, and that was about 14 years ago, but I have never forgotten the experience and would love to repeat it one day. I find horses fascinating and beautiful creatures, and that is what led me to request this title for review. And the photography is stunning. I also liked how the images were arranged via terrain. However, one thing spoilt this collection for me: Where were the Icelandic horses? The book is titled 'World', but Iceland was conspicuous by its absence, even though they have a truly delightful and unique breed of horses over there. I even went back and flicked through the pages again, in case I'd missed them. But, no, they were not represented. This did make me sad. Also, as someone who likes horses but knows little about them, I would have appreciated a guide to the different breeds somewhere in the book, even just as a brief appendix listing each breed's location and traits. So, overall, I give this three and a half stars. It was lovely, but to my mind there were a couple of things missing which, if included, would have made it perfect.